I am always thrilled to create and share quick and easy recipes. Did I share with you all that I have amazing and talented friends who are such warm human beings. I feel blessed and am so grateful for being a small part of their lives. They are so gracious and generous to share their family recipes . I am so happy to share the recipes shared by them . They are all tried and tested and also a big hit in their homes. 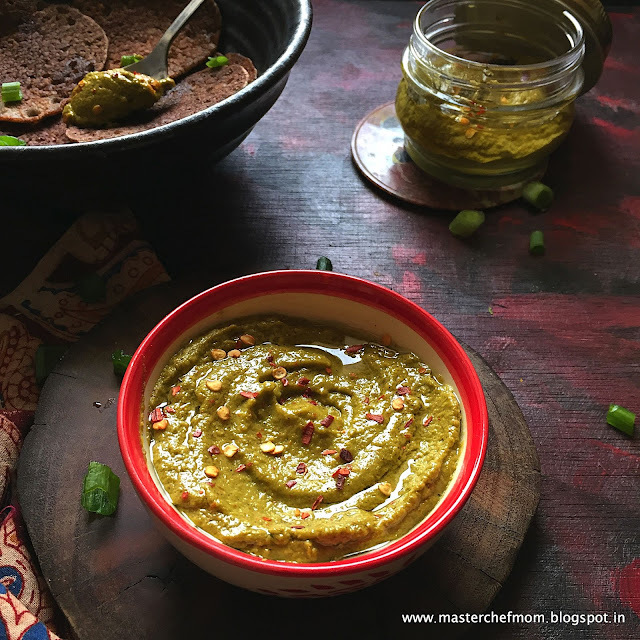 Recently when I visited my friend Kavita’s home, she asked me to taste a dip/spread that she had made and quizzed me about the main ingredient. The dip was so tasty and tasted familiar but I failed to answer the right main ingredient. I was so surprised to learn from her that it was ‘spring onion/scallion’. When she shared the entire recipe with me , I was even more excited , as it had only 3 main ingredients – sesame seeds, peanuts and scallions !! We had a good time catching up and I came home so refreshed. Don’t we all feel refreshed after time with good friends? But , that scallion dip was on top of my mind. Next day, I went to the market to get a fresh bunch of spring onions and recreated Kavita’s recipe. In fact, in my excitement, I forgot to roast dry red chillies and added red chilli powder instead. But it tasted equally good. So you can try both ways. It was simply delicious ! 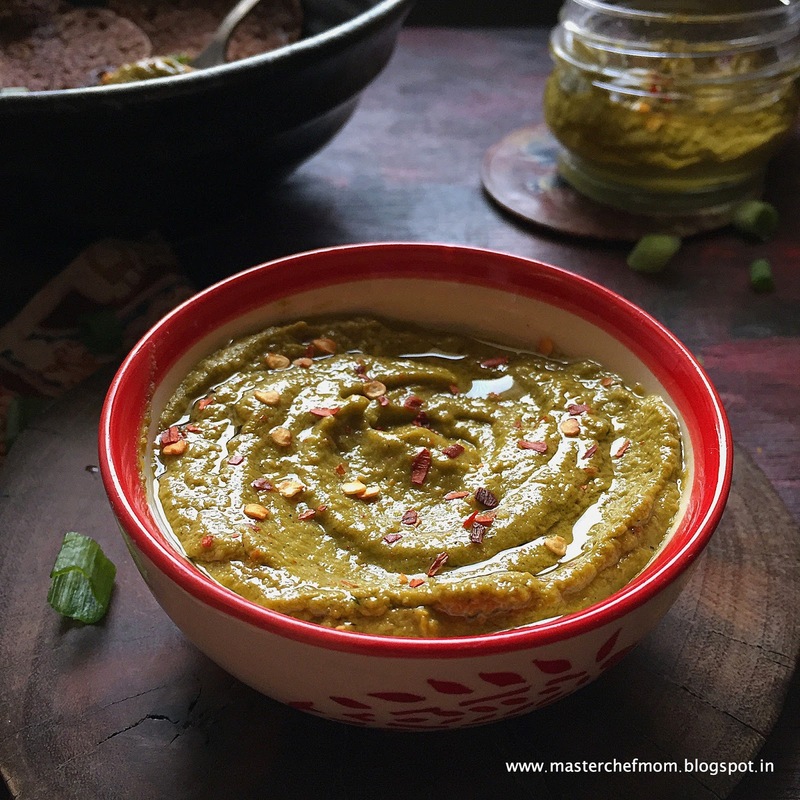 You can serve them along with crackers, chips, savoury biscuits, pita bread or even use them as a sandwich spread. I have tried all of the above, they taste amazing. 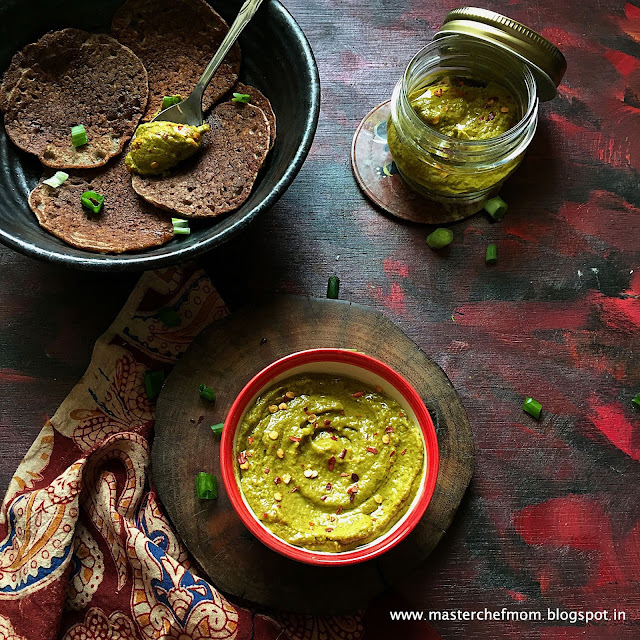 I even made mini dosa using my Ragi Lentil Dosa batter ( dosa tacos) and spread the scallion dip. Simply amazing and so healthy. You can store this dip in a clean and dry glass bottle , add a teaspoon of oil on top. Storage : Keeps good for upto a week when stored in a clean , odour free and dry container. 1. Dry roast the peanuts and sesame seeds separately and add it to the jar of a mixer or food processor. 2. Add the washed and chopped spring onions and leaves, spice , salt , jaggery powder ( if adding) and lemon juice . Chef tip : Use less amount of leaves for better flavour. 3. Grind them smoothly without adding any water. Chef tip : You can add oil to grind smoothly . 4. Taste and adjust the salt and spice. 5. Transfer it to a clean jar /container and add oil to seal the freshness. Your super yummy, flavourful and fresh dip/spread is ready to use immediately or later. It is handy to have this ready in your refrigerator. Much better than any store bought spread/dip. A perfect side to your party starters too.